Unfortunately Grandma's body had started to fail her the past few weeks (boy she had spent a lot of time in the hospital) and she died on September 26th. She was one of the most amazing, strong, FUNNY women I have ever known and she will always have such a special place in my heart. We always had such a great relationship and although her move up north wasn't her favorite idea, I am convinced it was for the best. She was able to spend SO much more time with family and my kids really did get to know and love her. I will never forget all of the fun times we had and I will cherish all of the stories of her life she had started to tell me over the past couple of years (during the time of cleaning out her Florida house). Some pictures from Joanna and Blake's awesome wedding weekend. There are SO MANY good pics I may have to put the rest up in a separate post. The kids (Richie and Natalie) did awesome! You have never seen two cuter kids. A southern bbq rehearsal dinner.....beach wedding and yummy brunch to top it off. They nailed every detail for the perfect wedding. And the best part....seeing all of the family. Cousins from the west coast.....lots of fun memories. Wait until you see the video of Richie cutting a rug on the dance floor. Just don't know where he gets those moves from, but he had us all laughing. Congrats to Joanna and our new cousin Blake! The day had finally come that Richie had been talking about all summer.....SOCCER!! This kid loves sports so there is nothing better than when a new season starts. He is on team Italy and his friend Christina from St. John's last year is on his team. He is already pretty good, but I am looking forward to watching him improve. More pics as the season progresses. Not sure why I thought this was a good idea, but both of my kids started "school" on the same day. Made for an absolutely crazy morning/afternoon, but the kids were thrilled. We all went together to drop Angela off at her KinderCare. She was so excited...until about the time we got to the door. Then she realized exactly what was happening and the tears started. Her teacher had to pry her off of me which of course just broke my heart and made me cry. When I went to pick her up she started crying again when she saw me. BUT, through her tears she said, "Mommy I had a good day". More tears by me. Maybe tomorrow she will smile or eat her lunch (or even a snack). Notice no additional first day of school pics of Angela. I hated to take them of her crying. I will try to catch her with her new school buddies in a few weeks. This weekend was my annual Girls Weekend in Portsmouth, NH. Ah, the relaxation and shopping with good friends....priceless! I am a VERY lucky girl. 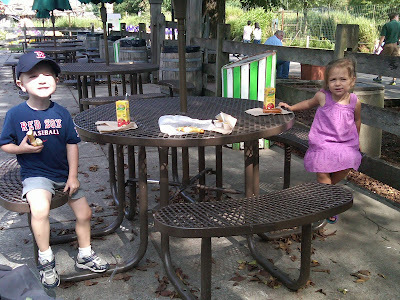 While I was gone Chris took the kids to the zoo. Never a bad day when you get to spend it with animals. They also had a bbq with their friend Maddie. I think it is tradition for the boys to get together when the girls are gone. I am OK with parenting in numbers. Today was a sad day because it was the kids last official day with Dawn. It means it is the last day of summer.....and of the help she gave us. We are ALL pretty devastated. I can't begin to tell you how much easier she made my life for the past 2+ years she was with us and the kids are head over heals for her! Luckily she lives in our neighborhood so we plan to still see her all the time still. The worst part is that it means my babies are GONE! On their last day Dawn took the kids to the Museum of Science. You can see below that they touched every exhibit. Actually that is a literal statement. You can see the one picture of Richie getting a lesson on the lung from a museum curator. The one thing he said was not to touch it. Angela proceeded......to lean in and touch the lung. That's my girl! Today my baby girl spent some time at her day care center all by herself. She did pretty well although I on the other hand did not. It was one of the hardest thing I have had to do. How is she old enough to go to "school"? I had to go to Starbucks to pull myself together. She was only alone for an hour, but it seemed like a life time. When I went to pick her up and she saw me she started crying again. I ran up to her and said, "What is wrong?" Through her tears she said, "I had fun Mommy". It was so cute. I think she loved it, but it was just emotional for her as well. Her first full day is Monday. That is going to be a BAD day for me. Dawn took the kids on the train to this cute place called Made By Me. It is a place that has all kinds of pottery that you paint and then they put into the kiln so it becomes dishwasher and microwave safe. The kids made a bowl and a plate and I can't wait to see how they look because the kids are obsessed with what they eat out of. It is a daily fight. I guess we will get it back in a few days. One their way home from Porter Square they stopped in at my office. I was so excited to see them and of course so was everyone in the office. Perfect rainy day activity. I touched the Stanley Cup!! So as everyone knows, the winning NHL hockey players each get to spend a day (any way they want) with the Stanley Cup. To make a long story short, Andrew Ference decided that the North End was now his home so he brought the cup "home" to us! With a hysterical impromptu parade (including our own Roma band) through the streets, they ended with a flash mob! I might have to find the links with the video of all of this. We personally knew about all of this so we set out to find the cup. It was a hungry, cranky time for my kids (we had just had a play date with the kids going to Richie's new school at the playground) so we just wanted to get our glimpse and go home. Chris and I were inspired late in the week to spend as much time as possible outside since Labor Day marks the unofficial end of summer. 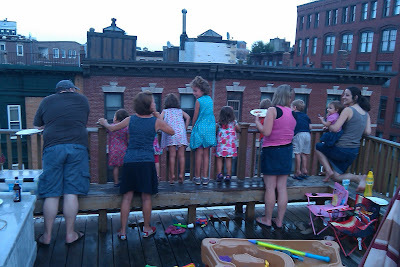 We also realized we had not had as many friends as we normally would have up to the roof. Boys those kids really get in the way! It was exciting that so many friends were around and came over for what turned out to be DANCE PARTY USA. These pictures do not even begin to tell the real story of how hysterical it was and how much fun we had! Our kids love Top 40 hits and boy can they get down and dance. The St. Anthony's feast was rescheduled for this day so everyone loved getting to see the parade. Also, a few people stayed later than others.....you can see who I mean below. Our sons fell asleep ON each other so we could party into the night. Chris and Mike took Rich and Maddie for the second year in a row to Norton, Mass to the Deutsche Bank PGA golf tournament. The kids remembered last year and were so excited to go back again. 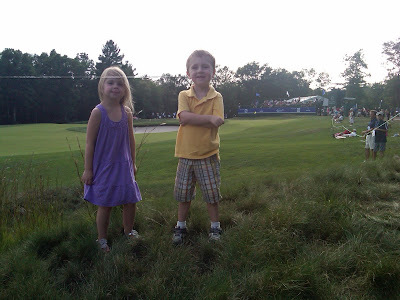 What 4 year olds have already been to two professional golf tournaments?? We had such a fun Labor Day weekend planned and it started with our Mommy/Richie/Angela Friday. We headed out in the morning to just enjoy the day in the city. Carousel....aquarium seals.....boats...we did it all on the way to lunch with our friends Lucie and Eva at the Barking Crab. It was such a gorgeous day and the kids and I were just having so much fun running around with each other. After our lunch date we ran home for a play date with our old day care friend Jackson. These two boys play so well together and just tore the house apart. That was just fine with me because Angela was sleeping and I got to spend time with Jackson's mom and her new 3 week old. Oh who doesn't just love a new baby! Welcome to the world Sohie Love! So sad I didn't get pics of this part of the day.